Like most people, I love a good caesar salad. I even like an average caesar salad, which many seem to be. There's something about that tangy dressing that's so compelling. Umami from the anchovies and parmesan? Probably. Seems like every restaurant has one on the menu - chicken caesar, walleye caesar (shout out to Ye Olde Wharf up on the Whitefish chain in Crosslake, MN for that one), caesar wraps and sandwiches. The very best ones have bright acidity, a little richness and lots of anchovies and Parmesan Reggiano cheese. Fresh croutons that are crispy on the outside and soft on the inside make a difference as does the quality and cut of the lettuce (and please do cut the lettuce - it's just lazy to serve me giant leaves of romaine...there's no good reason for it). So when I saw a Jean Georges Vongerichten recipe for a kale salad with a caesar-style dressing, I couldn't wait to make it. His salad is comprised of raw, ribboned kale with a little mint (or basil, in my case) mixed in, topped with thin slices of not-too-spicy serrano peppers. The dressing follows tradition except for a fat pinch of red pepper flakes and a spoonful of lemon zest. 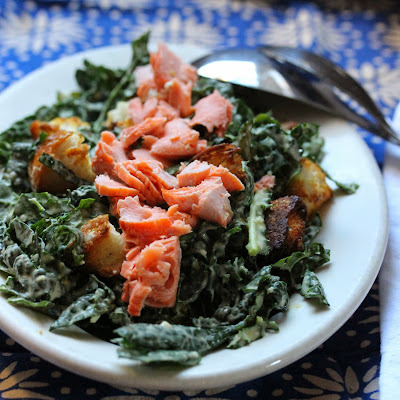 You dress the salad and let it sit for a bit to take some of the squeakiness out of the kale. I flaked some baked salmon on top to make this a meal. Killer. If you have someone who makes at stinky face at the mention of kale, serve them this. They will be singing its praises before the meal is out and you can feel warm and fuzzy for having opened a mind and filled a tummy. Note: the recipe says it serves 4 but that assumes everyone will be happy with a cup and a half. They won't be, so plan accordingly. 2. 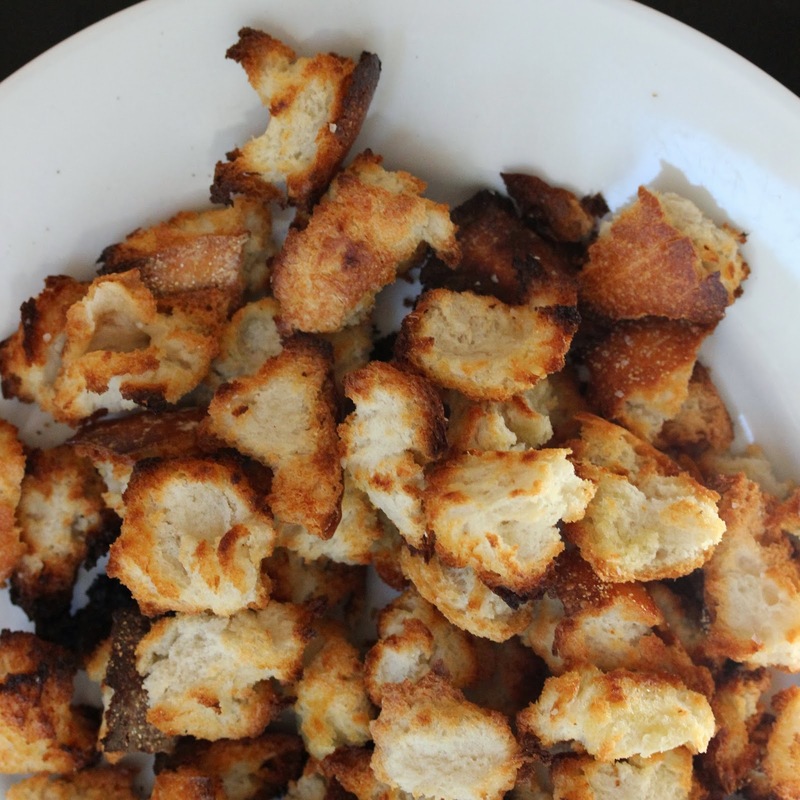 Tear bread into 1/2 inch chunks and place on a sheet pan. Drizzle a few tablespoons of olive oil over the bread, sprinkle with salt, toss and bake for 10 minutes or until golden brown. 3. Put all dressing ingredients except oil into the bowl of food processor or blender. Process, adding oil in a stream, until blended. 4. Remove and discard tough ribs from kale, stack and roll into a cylinder then slice into thin ribbons. 5. Thinly slice basil and pepper. 6. Toss kale and basil vigorously with 1/4 cup of dressing (or more to taste). Add croutons and toss again. 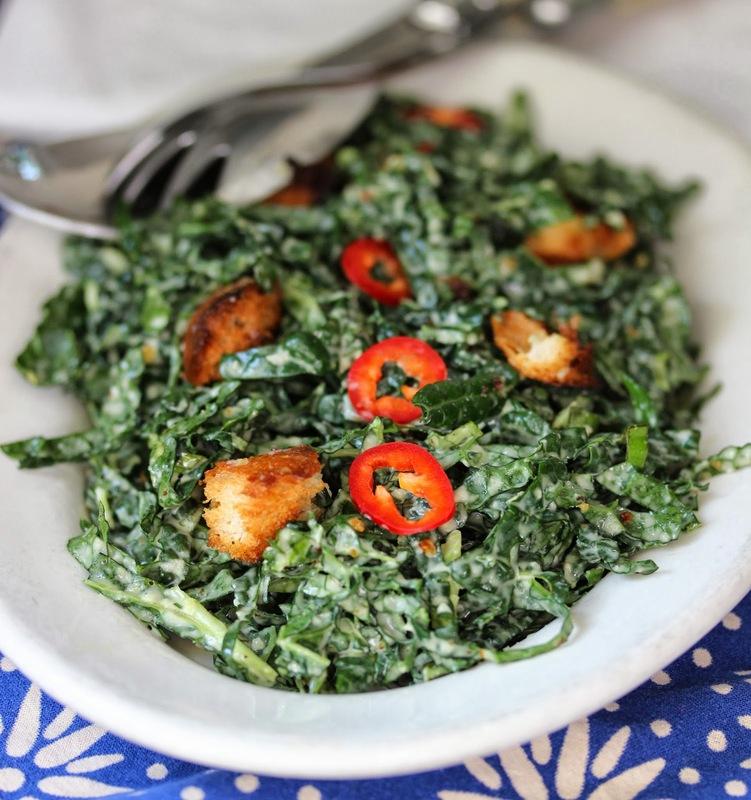 Let rest for 15 minutes to soften kale then serve on a platter with the hot peppers scattered over the top. *Tuscan, Dino or Lacinato varieties work best for raw salads.